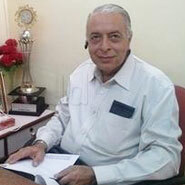 Chief of Traumumatology at the Sancheti Institute for Orthopedics and Rehabilitation at Pune since June 1990. The above institute is a premier institute catering to Orthopedic patients, having 120 beds and all modern facilities including C.T. Scan computerized scan, ultrasonography and image intensifier. Recognized post graduate teacher for the M.S. Ortho. Degree of Poona University since January 1987. Since June 1981 have been training post Graduate students for M.S. Orthopedics, on the teaching faculty of Sancheti Institute, Pune. All post graduate students from Sassoon Hospital, K.E.M. Hospital, Armed Forces Medical college and Sancheii Institute attend the teaching programe at Sancheti Institute. Journal of Paraplegia, 1985, Vol. 20 : 288-295. Treatment of Non-unions by pulsed electro-magnetic field stimulation at the MSOA Annual Conference at Miraj – 1985. Reconstruction of lower end humerus fractures using transolecranon approach at the Silver Jubilee BOS conference- 1989. Treatment of difficult non unions of the humerus at MSOA annual conference at Kolhapur – 1990. A C L Reconstruction’ MOA 1992. Results of Tibia Plating’. R. Joshi, K. H. Sancheti, A. N. Damle. R. Arora read at the 9th MSOA conference at Jalgaon 1991. Experiences with Limb Lengthening, A. Chandratreya, K. H.Sancheti, R. Joshi, R. Arora, A.D.Diwan, read at the 9th Annual MSOA conference at Jalgaon in 1991. Consultant in Orthopedics at the Sancheti Institute for Orthopedics and Rehabilitation, Pune, since l981. Consultant orthopedic Surgeon on panel for Tata Electric and Loco-motive Co. Ltd. Pune since 1985. Consultant Trauma Surgeon for Royal Western India Turf Club, Ltd. Pune since 1988. Honorary Orthopedic Surgeon, Poona Hospital. Special interest in rural rehabilitation. Attended more than 100 diagnostic and operative camps in polio in Central and Western India earlier as Trainee and now as team Leader. In these camps about 1,50,000 patients have been examined, 6500 operations done and 10,000 appliances fitted. Member of Poona Orthopedic Society, was secretary of same from 1988 to 1990. Member of Indian Orthopedic Association. Member of Maharashtra Orthopedic Association. Member of Indian Medical Association.